Who is on Drug Safe Utah’s list opposing the medical marijuana initiative — and who’s not? (Trent Nelson | The Salt Lake Tribune) Kem Garnder speaks at a news conference where a coalition including the LDS Church came out against Utah's medical marijuana initiative, in Salt Lake City on Thursday Aug. 23, 2018. 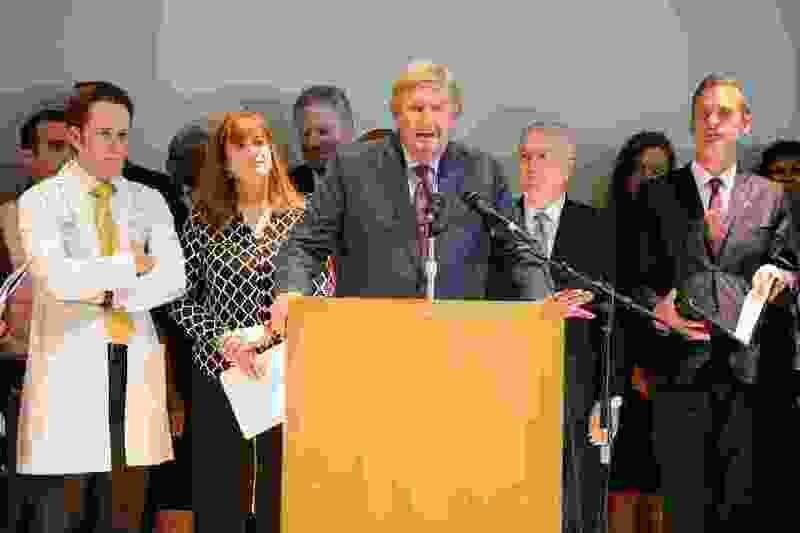 Representatives of the LDS Church, Utah Episcopal Diocese, Utah Medical Association, Salt Lake Chamber of Commerce, Utah Sheriff’s Association and Utah Parent Teacher Association stood side-by-side on Thursday to voice their opposition to a ballot initiative that could legalize medical marijuana in the state. They were also joined in proxy by 18 organizations and 65 individuals who had signed onto a statement encouraging collaboration and further research into the medical benefits of cannabis and marijuana derivatives. “The marijuana initiative appearing as Proposition 2 on the ballot this November does not strike the appropriate balance in ensuring safe and reasonable access for patients while also protecting youth and preventing other societal harms,” the statement read. But as notable as the faces on stage and the names on the list were, so too were the names and faces absent from Thursday’s event. Jean Hill, spokeswoman for the Catholic Diocese of Salt Lake City, said Catholic leaders were approached within the last three weeks about signing the statement. They declined, she said, as the issue of medical marijuana is complicated and the diocese is not ready to take a position — positive or negative — on the ballot initiative. Among Utah’s political leaders, Congressmen Rob Bishop and Chris Stewart both signed onto the statement. But they were not joined by their colleagues in Utah’s federal delegation, Sens. Orrin Hatch and Mike Lee or Reps. Mia Love and John Curtis. In a prepared statement, Love said there are many Utahns who suffer needlessly from legitimate medical conditions who could benefit from medical marijuana. She said she’s happy LDS Church leaders clarified their position on the issue, and hopes that voters will be encouraged to study the initiative and inform themselves. “I believe we have an opportunity,” she said, " to create policies that help relieve that suffering and give people options that are both prescribed and monitored by their physician." Stewart’s inclusion on the list was something of a surprise, as he told The Tribune on Tuesday that he was unaware of any requests by Drug Safe Utah — the coalition opposing the ballot initiative — to participate in a statement or press event this week. “Congressman Stewart had numerous discussions over the last few days with many individuals and made his decision after those conversations,” said Daryn Frischknecht, Stewart’s spokeswoman. Mitt Romney, who is running for Hatch’s U.S. Senate seat, signed onto the coalition statement. His Democratic opponent, Salt Lake County Councilwoman Jenny Wilson, told The Tribune that she was not approached by Drug Safe Utah, and that she supports the medical marijuana initiative. The Drug Safe Utah list also included a number of individuals who reversed their positions after initially supporting the medical marijuana initiative. Among those is Salt Lake County Sheriff Rosie Rivera who told The Tribune on May 31 that her support for the initiative was partly based on the experience of personal friends who suffered from cancer. On Thursday, Rivera said she supports the question going before voters in November, but that she will vote against it. “There are not enough safeguards in place for me to support the proposition as it is written,” she said. A total of 37 Republican state lawmakers joined the statement, including Utah’s House speaker, Senate president, and both the House and Senate majority leaders. The list did not include a single Democratic member of the state Legislature. And after the press conference, the House Democratic Caucus released a statement supporting the right of Utahns to weigh in on the topic in November. Three of the five physicians in the Legislature were not on the list. Other individuals and organizations who signed on to oppose the initiative include the Islamic Society of Greater Salt Lake, Latinos in Action, Utah Eagle Forum, Zions Bank President and CEO Scott Anderson, Larry H. Miller Group of Companies owner and Chairwoman Gail Miller, former Utah Gov. Mike Leavitt, developer Kem Gardner, Salt Lake County Council Chairwoman Aimee Winder Newton, philanthropist Karen Huntsman and son, David, president of the Huntsman Foundation, the Utah Hospital Association and Sutherland Institute. TRUCE — a patient and medical marijuana advocacy group — issued its own statement on Thursday in response to Drug Safe Utah, saying the coalition’s arguments were disappointing, factually incorrect and harmful to the welfare of patients. Karen Huntsman is the mother of Paul Huntsman, owner and publisher of The Salt Lake Tribune. David Huntsman is Paul Huntsman’s brother. Thomas Burr, The Tribune’s Washington Bureau chief, contributed to this report. Clarification: This article has been updated to include a quote from Rep. Mia Love, R-Utah. An earlier version also misrepresented the gender of Daryn Frischknecht, spokeswoman for Rep. Chris Stewart.